How Do Your Senators and Representatives Vote? 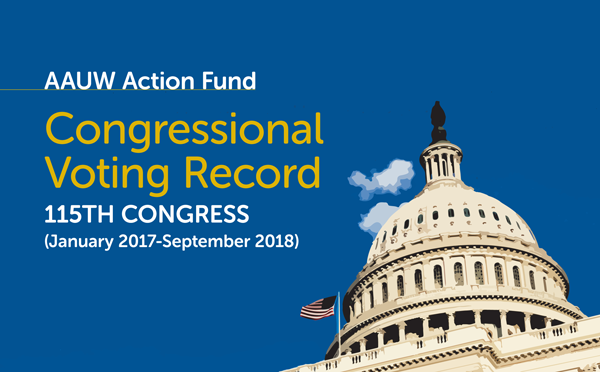 The AAUW Action Fund Congressional Voting Record (CVR) provides information about elected federal legislators through the votes they cast on issues that are critical to the Action Fund’s mission. Find out how your elected officials scored! Download the Congressional Voting Record for the 115th Congress. Writing letters to the editor (LTEs), blog posts, or op-eds about a legislator’s position on AAUW’s priority issues. Our LTE resource guide provides sample talking points for an effective letter. The voting records are neither endorsements nor a condemnations of any member of Congress. They reflect only roll call votes officially recorded on the floor of the U.S. Senate or House of Representatives. For more information, please contact the AAUW Action Fund at 202.785.7793 or VoterEd@aauw.org.